On a large baking sheet toss together sweet potatoes, 2 tablespoons oil, and ½ teaspoon salt. Roast until tender, about 25 minutes. Meanwhile, in a medium saucepan combine rice and 3½ cups water. Bring to a boil, cover, and reduce heat to simmer until rice is tender, about 12 minutes. In a food processor pulse ½ cup walnuts, maple syrup, vinegar, garlic, mustard, pepper, and ½ teaspoon salt until walnuts are finely ground. With the motor running, add 4 tablespoons oil in a thin stream. 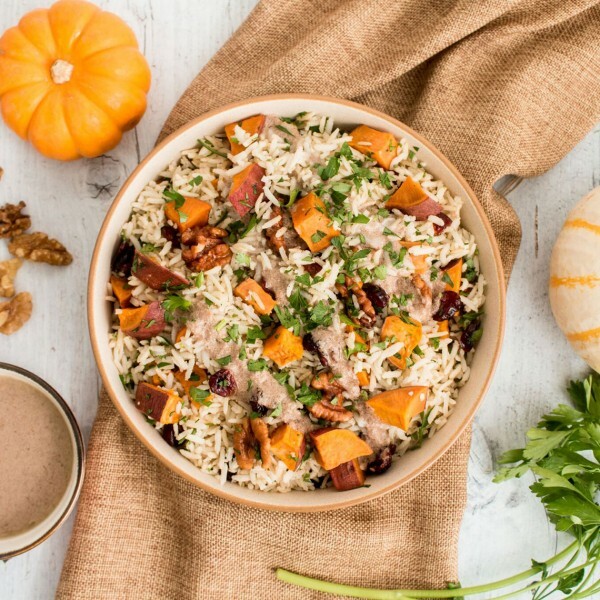 In a serving bowl toss together rice, sweet potatoes, remaining ½ cup walnuts, cranberries, parsley, and dressing.